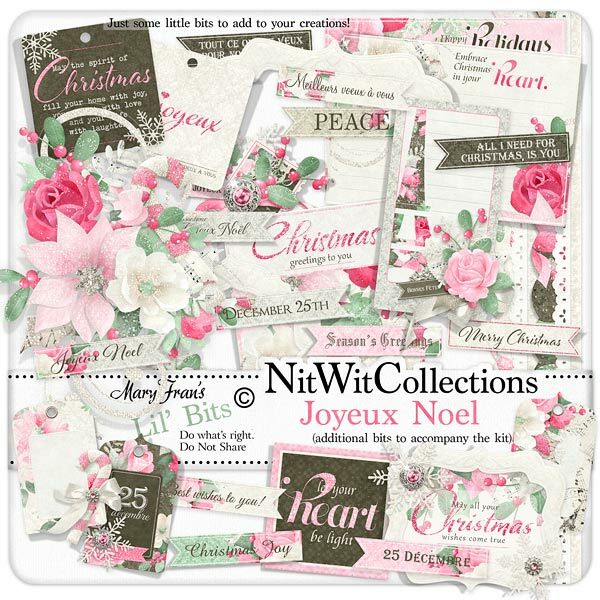 Lil' Bits "Joyeux Noel" is a MUST HAVE digital elements pack to enhance all of your cards, mini albums and scrapbook layouts! Amazingly designed frames, journal cards, sentiments, tags and more will give your Christmas creating such style and beauty, and so very easy to place in to achieve sensational results! Don't miss out on these digital elements as they are not included in the FQB "Joyeux Noel" Collection so please don't miss out on owning and creating with these elements! 1 Floral Cluster with elaborate swirls, a poinsettia and a rose...gorgeous! 1 Journal card - "Christmas Greetings to You"
1 Journal square with an extensive area for you to write in - "Embrace Christmas in your Heart"
1 Journal square in pink with a more than ample journal area - "Happy Holidays"
1 Label square - "Let your Heart be Light"
1 Sentiment tag boldly created in black and pink with sparkling snowflakes - "May the Spirit of Christmas..."
1 Sentiment tag - "Joyeux" Simple elegance!! 1 Tag with the Eiffel Tower and room for a name or small sentiment - "Bonnes Fetes"
1 Tag - "25 Decembre"